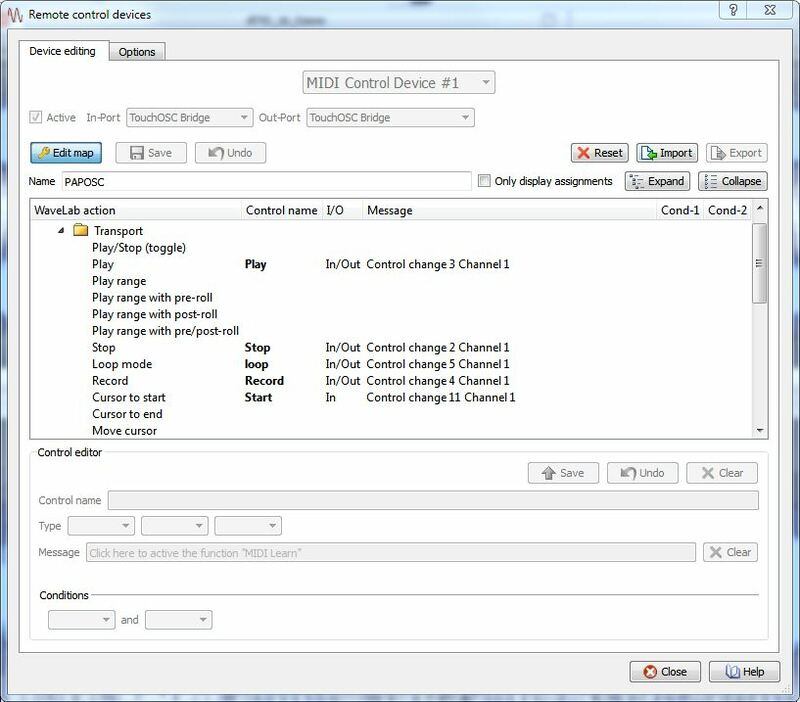 Do you have an iPad / iPhone or Android device and do you want to use it as a wireless remote controller for Cubase / Nuendo? If the answer is “Yes!”… Here’s how. First of all I should mention a few things: This is not really anything new to the tech-heads out there and is certainly not the only way to control your DAW with an external device. Also there are other Apps that will do this job, some are in fact easier to set up than the one I am using here (Touch OSC). Some actually may offer more comprehensive features. 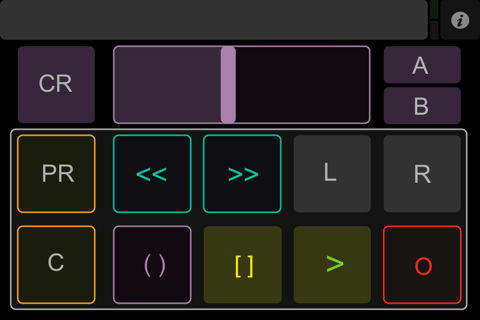 What I like about Touch OSC is that you can design your own panels and make them as simple or as complex as you want. For this guide, I am using Windows 7 and iPad / iPhone. I am going to make a single panel with a few useful features, nothing too complicated. Certain areas will work slightly differently with other operating systems and remote devices, (MAC and Android for example). 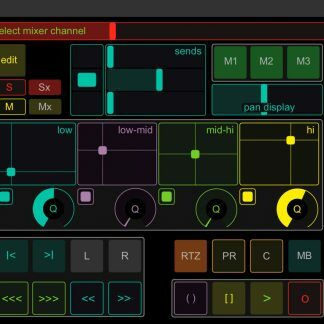 Finally, Android support for Touch OSC is a little lacking at the moment (it is possible but quite tricky to use your own custom panels), but it is getting there according to the developers. 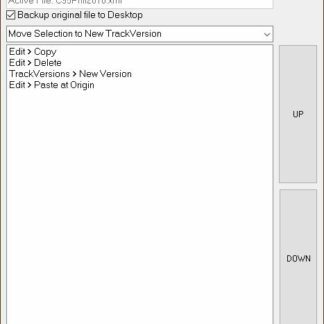 Cubase or Nuendo running on your DAW, I’m using Cubase here. A device that will run the Touch OSC application. 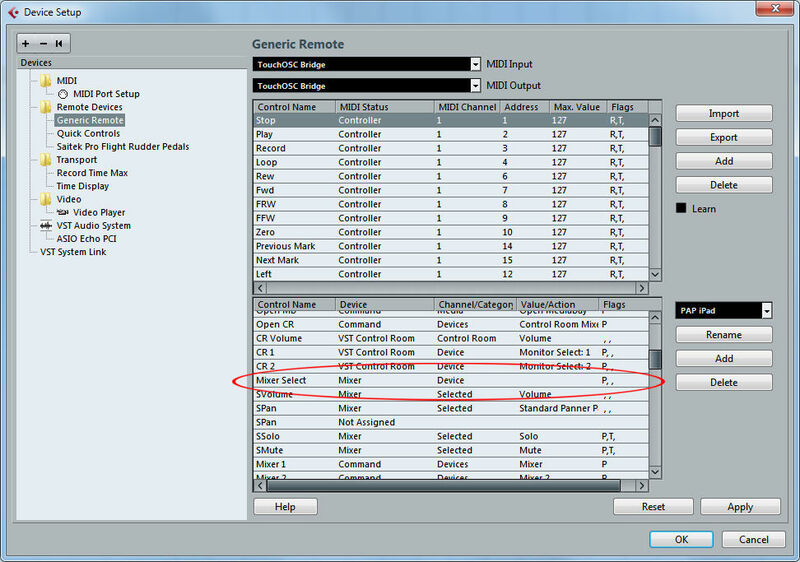 We then need to install the Generic Remote within Cubase and set the correct MIDI Ports. There are a few key things to bear in mind here before we go any further. Nothing will happen at all if the MIDI ports aren’t set. Nothing will happen at all unless the Generic Remote is set up to receive the correct commands from Touch OSC. 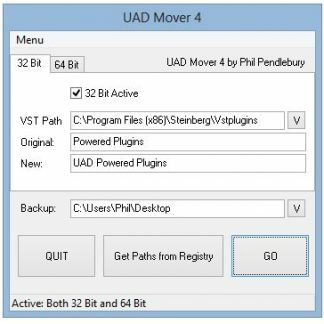 In order to get Cubase sending information back to Touch OSC we also need to make sure that any controls you add in the Generic Remote are set to Transmit AND Receive data. So now you can start programming commands. 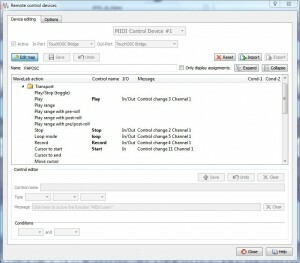 It is then quite simple to perform an action on the selected channel. In the lower GR panel, find the command you want. 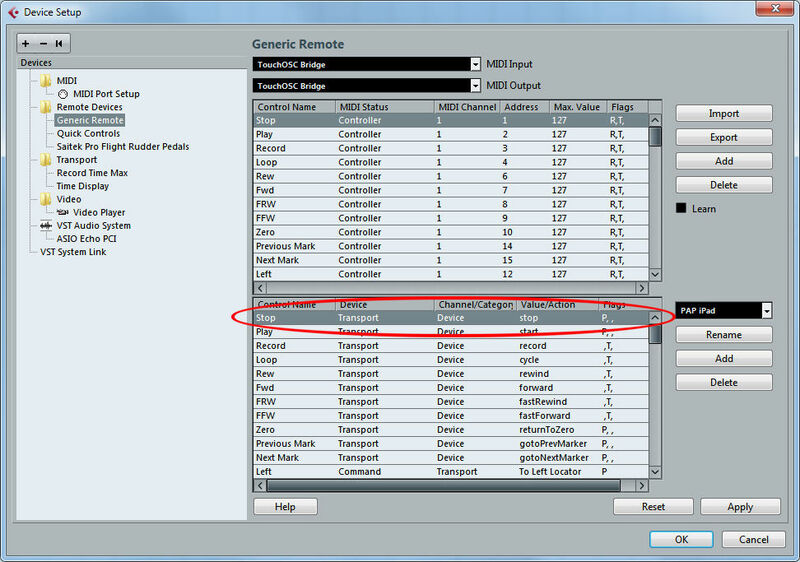 In the upper GR panel, assign a MIDI message to this command. 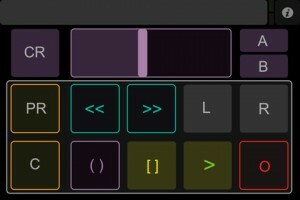 You can use the Learn function by selecting the MIDI command in the upper panel and pressing the corresponding control on Touch OSC. Remember to have T/R selected to get data moving in both directions. Perhaps the best way to understand this is to use an example of mine. In order to get this working you will need the Touch OSC editor up and running. 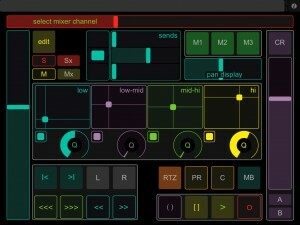 Download this zip file which contains the Touch OSC Panels (one for iPhone and one for iPad). You can use either or both. The zip file also contains the Generic Remote template that matches up all the commands with MIDI messages I chose to use. Extract the files from the zip file and upload the PAPiPad1 or/and PAPiPhone2 Touch OSC panels to your iPad or/and iPhone. 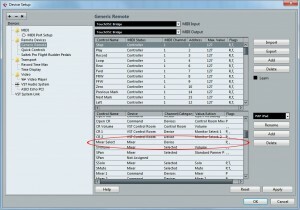 Now go to Cubase Generic Remote and Import the GR file PAPiPad.xml. If you have an existing GR setup you are using, don’t forget to export it first do you can get it back later if required. Bring up the panel on your iPad and close Generic remote after hitting Apply. If everything is done correctly, you should now be able to start controlling your Cubase project with Touch OSC. Your iPad should look like this. This is the basic iPhone panel. You will notice that some controls accept feedback from Cubase. Sadly some don’t. This is a whole different subject though and I’m not going to go into it here. Now you have that working, you can take a look at my Touch OSC panel in the OSC editor and see how it works. You can also look at the corresponding Generic Remote setup and commands. I often find that the best way to learn something is by looking at examples. So I hope this example has given you something useful to experiment with. If you have any questions, suggestions, feel there is something I have missed or could explain in more detail, please get in touch. Next post: Flying Training – The Heat is on!